Reinforced Structural Polymer Composite Repairs. Polypropylene board construction is not suitable for DIY repairs and requires specialist hot air welding. Blue Chip is well equipped and has vast experience in plastic hot air welding of boards, car bumpers, dinghies, canoes etc. Mix sufficient resin and hardener in the plastic container using the ratios given on the resin instructions. Beware of Exothermic reaction, this can cause a melt down if you use too much resin in a confined space. Apply the glass matting and stipple with the brush until completely wetted out with the resin. Cover with cling-film and stick down the parameter with masking tape and leave overnight. Sand down the excess resin and glass matting. Mix up sufficient Gelcoat to bring the repaired area to the board surface. Note; if the repair is deeper than 2-3mm, build up with several layers of Gelcoat, each layer should be no more than 2-3mm thick, allow each layer to harden before applying a subsequent layer. Once the final Gelcoat layer has hardened sand down with appropriate abrasive paper to give a smooth finish, which blends in to the surrounding board. The finishing process may take some time to give a perfect finish. If the damage is only slight, you may be able to miss-out stage 3. First, remove the old damaged grip and clean the tube to get all the old material removed. Next: apply the adhesive to the tube, (we uses Evo Stik - Time Bond Contact Adhesive) to get to the whole tube surface in one go, use a wooden dowel to insert into the front end of the tube. Next: Apply the same adhesive to the new boom grip. Follow the adhesive instructions regarding timings for the application. Next: Please read the next section completely before starting to apply the grip. Apply the new grip carefully along the whole length of the tube so that the long join will be on the outer length of the tube. 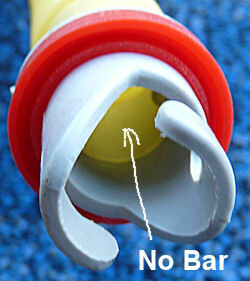 Make sure the tube only touches the centre line of the grip along its entre length. Once you are happy with the positioning of the grip/tube, start to wrap one side of the grip around the outside of the tube and make sure the long edge is flat and secure to the tube. then wrap the other side around the tube and overlap the first long edge along the complete length of the tube. Your boom tube should now look like the image to the left. At this point it is a good idea to use a wallpaper roller to burnish down the overlapping edge to ensure the second grip edge is in full contact with the metal of the tube. Next: Now use some sanding paper on a block to gradually were down the overlapping edge to leave a seamless finish. Small tears in monofilm panels are the most common type of sail damage. You can make good temporary repairs on any monofilm panel if the tear is no longer than say 20 cm and is a minimum of 2 cm away from any seam. Make sure there is no salt water residue left on the sail. If necessary rinse the damaged area with clean fresh water. Cut the Mylar Repair Tape with radius corners to over hang the damaged area by a minimum of 2 cm all around. Apply the Mylar Repair Tape to both sides of the dry sail. This type of repair can last a very long time. Larger tears can be temporarily fixed in this manner. However this will be strictly temporary. Extended use of a sail with a large tear usual leads to much more severe damage! In either case you should seek our professional advice as soon as possible. Our advice costs nothing and could save your sail ! Clean the damaged area with fresh water and thoroughly dry. Cut the repair tape with radius corners to over hang the damaged area by a minimum of 2 cm all around. Remove the release film to expose the adhesive, apply the repair tape to both sides (if possible) of the dry sail, then use a domestic iron (temperature adjusted to Nylon) to set the adhesive. This type of repair can last a very long time. Larger tears can be temporarily fixed in this manner. However this will be strictly temporary. Extended use of a sail with a large tear usual leads to much more severe damage! In either case you should seek our professional advice as soon as possible. Our advice costs nothing and could save your sail ! For best results. clean and roughen bond area prior to application. Cut off required amount of Aqua-Stick . Beware of exothermic reaction, this can cause a melt down if you use too much putty mix in a confined space. To mix; knead with fingers to a uniform colour. Apply to surface to be repaired (within two minutes of mixing). The mixed epoxy does not exhibit a high bond strength at this point, but appears to be merely lying on the surface. Force into any cracks or holes to be filed and clean off excess material. When applying to a damp, wet or a slowly leaking area work the material forcefully into the surface and apply pressure until adhesion begins to take affect. For a smooth appearance of the cured compound. Hand rub with water or a damp cloth prior to hardening. Remove excess material before hardening begins. After just 60 minute, the item can be put back into service. Apply to surface to be repaired (within two minutes of mixing). The mixed putty does not exhibit a high bond strength at this point, but appears to be merely lying on the surface. Force into any small cracks or small holes to be sealed and clean off excess material. Original colours... All of our paints are colour matched here in our workshops and all contain additives including plasticizers which give great adhesion and keying properties, impact resistance and flexibility to your finished work. Our touch up paints can be thinned down with standard cellulose thinners. By following the simple instructions below you should be able to achieve a professional finish to your repair. Unfortunately each board will have fade characteristic unique to the UV exposure history of that particular board, the production run may also have a slightly differing colour value. For the perfect finish, send us a paint chip (1sq cm) and we can mix it ! The touch up paint we supply is based on the original colour for the board. We recommend the following procedure for best results: Spraying using an Airbrush (click here for our £20 airbrush complete kit), several light passes rather than fewer heavy passes. Blue Chip Primer Filler... This is the ideal primer for all repairs, with added adhesion properties for all composite substrates. Seals and primes the surface, makes the best surface to receive the final colour top coat. Our Primer Filler can be thinned down with standard cellulose thinners. Blue Chip extra adhesion Primer Filler is £5.00 for a 125ml tin. Original colours... All of our paints are colour matched here in our workshops and all contain additives including plasticizers which give great adhesion and keying properties, impact resistance and flexibility to your finished work. Our touch up paints can be thinned down with our standard thinners. Blue Chip colour matched extra adhesion Touch Up Paint is £10.00 for a 125ml tin. A white base primer filler should be applied and rubbed down. The Primmer Filler should be thinned just enough to use with the airbrush (20% thinners 80% paint is a good starting point but trial and error / experience is the only way you will get this correct). Repeat stage 1 until an indiscernible fading out (visual and touch) to the original colour and finish is achieved. It is pointless progressing beyond stage 2 until you have achieved the indiscernible fading out (visual and touch) to the original colour and finish as the final coat can only be as good as the finish achieved with the initial primer coat. Second colour coat Repeat stage 2 with the paint thinned down to 20% thinners / 80% paint. Rubbing down Once the second coat has cured (the time scale will depend on temperature and humidity) rub down with a scotch cloth, gentle small circular motions to give the final coat a good surface to lay on. Do not expose any of the white primer as the final coat will have a high degree of transparency. Finishing coat Thin the paint to 50% and adjust the spray to minimum for this the final coat. The area to include the original board for about 20cm over spray. Do not apply too much paint or more than two spray passes. Finishing touches Once this final coat is cured you can matt down the finish if required by buffing down to a matt finish with a scotch cloth, gentle small circular motions or buff up to a final gloss finish with a soft cloth. 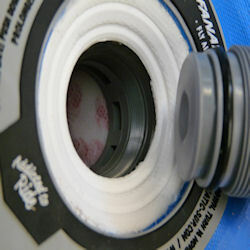 If you are applying grip additive, this must be applied without delay to the wet Aqua Grip. As the Aqua Grip cures it will seal in the grip additive particles to give you a long lasting grip coating. Grip Additive Application Test If you are not using a using 200bar ceramic wide nozzle powder spray for the additive application, you can use an empty jam jar with an old nylon stocking secured over the top. Do a teat sprinkle onto a sheet of coloured paper to make sure the nylon stocking is of the correct openness to give you the desired covering. Once you are satisfied with the result of your sprinkle, pour the Grip Additive back into the jam jar and re apply the nylon stocking over the opening. Grip Additive Application Now apply the Aqua Grip as detailed in the Aqua Grip instructions above and immediately apply the Grip Additive while the Aqua Grip is still wet. The Blue Chip Hose Gizmo fitting instructions: Just insert the gizmo into the hose end with a firm twisting motion, and that's it! Most 12v compressors that fit into a "12v vehicle accessory plug"
These compressors are designed to pump up a car tyre - a 10'6 x 32" x 5" board will hold about 50 car tire's worth on air and may well burn themselves out. This type of compressor should only be used to top up your board pressure, be patient as the 12v accessory compressors pump at very low volume, they pump a car tyre in say 5 minutes then multiply that by at least 50 for your board !! You can double check the board pressure by re-fitting your hose and pumping down. Do not leave your board in the sun, the internal pressure could increase by 75% so 20 psi could increase to 35 psi !!! 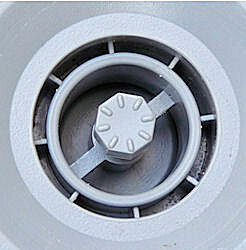 Having problems with your Bravo HP Pump ? 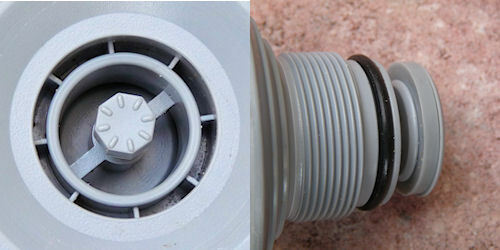 If your hose has a bar running across the center of the bayonet fitting, this may cause the automatic valve in your board to lock into a permanent open position and in doing so, release the air from the board as soon as the hose is removed from the board valve. 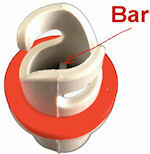 Most bayonet fitting now come with the bar removed so as to alleviate this possible problem. If you are suffering with this involuntary deflation of the board when you remove the hose from the board valve, just knock out the centre bar with a flat blade screwdriver and this with do away with this problem completely. 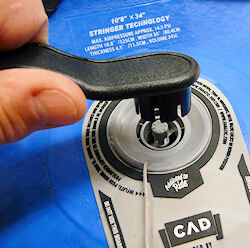 Once the bar has been removed, the pressure gauge will only read the correct pressure on the down stroke of the pump. This is because the board valve will automatically close at the end of the down stroke of the pump stopping any air escaping from the board or giving a reading to the pressure gauge on the pump. There are two ways of correcting the situation, you can remove the outer valve housing from the board using the valve key (tool) provided in your repair kit. 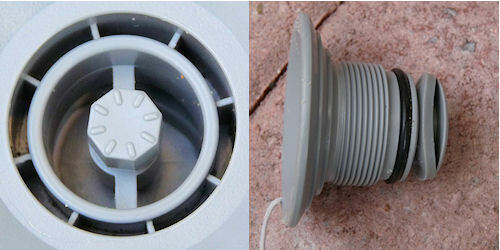 Now you can clearly see the problem of the dislocated sealing washer and why the air escapes when you remove the hose or Gizmo.